This course is designed to describe the home safety hazards and challenges facing older adults and to offer solutions in the form of adaptive equipment and home modifications. It will describe the common cognitive, physical, and visual impairments older adults face as they age and how these issues lead to injuries and loss of independence in the bathroom and bedroom. The course will highlight the factors to consider when deciding upon equipment or remodeling. 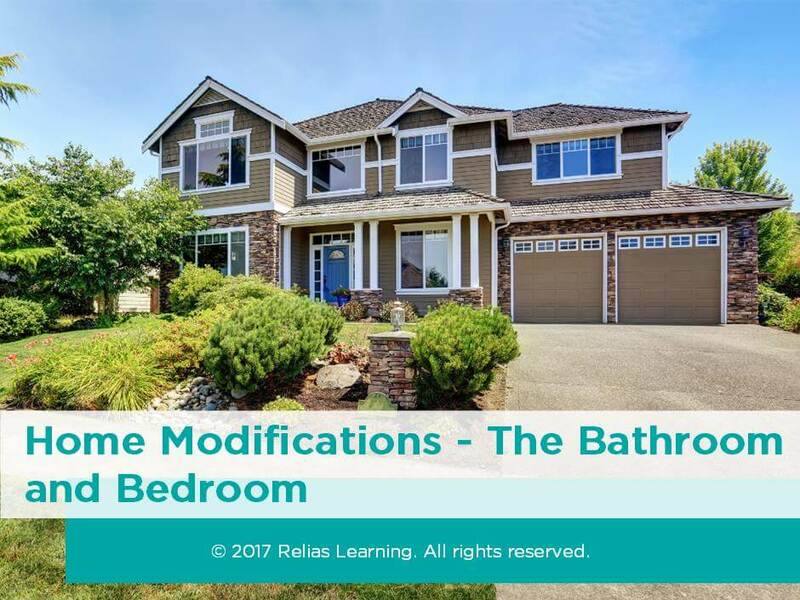 The course will also summarize available options for home modifications, specifically related to the bedroom and bathroom. Finally, it will present multiple brief case scenarios and offer solutions for adapting the client�s home, specifically related to the bedroom and bathroom areas, to fit their needs. This course has been approved by the Alabama State Board of Occupational Therapy for 1.00 contact hours, approval number 20-593979. This course has been approved by the Florida Board of Occupational Therapy for 1.00 contact hours, approval number 20-593979. What Changes Do Older Adults Experience as They Age? How Can We Measure These Changes? How Do These Changes Affect Independence and Performance in Activities of Daily Living? How Common Are Falls Among Older Adults? How Costly Are Falls Among Older Adults? How Can Home Modification Help? What Factors Should Be Considered When Deciding on Home Modifications? What Personal Factors Should Be Considered When Deciding on Home Modifications? What Are Examples of Home Assessments for Older Adults? What Are the Options for More Extensive Home Modification? Tameika McLean is an occupational therapist working in the Washington, DC area. She has worked in the acute care, acute rehabilitation, subacute rehabilitation, skilled nursing, and outpatient settings. She graduated from Columbia University with an MS in Occupational Therapy in 2014. Disclosure: Tameika McLean, MS, OTR/L, CAPS, ECHM has declared that no conflict of interest, Relevant Financial Relationship or Relevant Non-Financial Relationship exists. The target audience for this course is: entry level Occupational Therapists; in the following settings: Home Health.